The City of Dublin, Ohio in a few months is going to be working with students at the Ohio State University on an archeological excavation of an Adena and/or Hopewell historical area on recently acquired city property. The City of Dublin is looking for recommendations of signage/security measures that you or your organization have posted encouraging inquisitive citizens to stay out of the excavation area and encouraging students (or anybody for that matter) using the area to not remove artifacts. This is a relatively low key residential area and Dublin is looking for something a little more refined than a large red keep-out sign. Most posters here have probably forgotten more about this topic than i have ever learned :). So any information you could provide would be extremely helpful in our endeavor. First question - how far from view will the work be - as in - is this right on a street, or back in a parkland area where the workers will not be seen? I ask because in my role as a SHPO archaeologist I often work with projects where we need to protect sites during construction, as well as long range once the new development is in. In those cases, the archaeology work is often not visible to the public - and a good approach is to use signs that designate the area as "Environmentally Sensitive Area" "Please keep out/do not disturb", etc. These have the effect of letting folks know there is something that might be endangered, why not adverstizing just was it is to those that may want to collect for themselves. If the area is one where the workers will be easily visible to any passerby - your signs need to be a bit more revealing - but should still express the need to avoid entry. In cases like that you can identify the area as undergoing scientific testing, please keep out so as not to disturb the work in progress. You can also add - No Tresspassing - City Property and Violators will be prosecuted. That is often also a place to add something about how the artifacts are considered property of the city and removal of them would be considered theft of city property - if you feel a need to go that far. Hopefully the area of excavation can be fenced, even if only with temporary show fencing onto which these signs can be placed. Even a simple fence that most folks can hop over actually serves to deter most folks from wandering into an area - and those it does not deter will not be stopped by signs along either. You should also work with the city to insure that the local police make regular passes after work is done for the day, and even make the effort to chat with them during the day and let them know what is happening and how they can help - the same goes for neighbors since the project may be in a residential area. It is amazing how such personal contacts can increase the vigilance of neighbors who will become protective of the site themselves. On the other hand, failur to make those contacts can just make neighbors more curious and more likely to wander over after you leave. Finally, are there plans to "open the site" to the public when you are done (or even earleri) to show them what your efforts have revealed? If not already in place, you may want to talk to the city about allowing such open house days. People are extremely interested in having the opporutnity to see archaoelogical work in their own back yards. If such days are possible - inlcuding a reference to them and the opporutnity for visits on your signs is a good wait to let folks know they will have a chance to see it all - without them needing to disturb the workers or the science underway by coming in whenever they want. Most of the time folks are just curious about what is happening, so letting them know there will be set times they can visit and ask questions is often a great way to gain some control. Good luck with your efforts, sounds like it will be an interesting project. I have found the Radiation Hazard symbol to be the most effective. Dmack89- Thank you very much for taking the time to write out the very helpful thoughts. There a few possible sites on the property. One site is pretty well hidden in the back behind a tree line, while the other other is out in the open near a roadway (it would be too easy if it was all well hidden). As you mentioned, luckily for now the neighbors are keeping vigilant watch of the property. It has been helpful in keeping a few people out of the area already. Although, once the excavation starts it may be difficult for the neighbors to know who is supposed to be there. After the initial excavation takes place the area is going to turned into a parkland. The area also contains an extremely old homestead from the mid 1800's. The plan at the moment is to show the progression of the diverse people who have lived in the area over time. I think you get the most mileage out of keeping the citizenry in the loop, as research collaborators. To that end, I'm a firm believer in signage that explains the importance of context, over just the raw spatio-temporal data from the materiality of artifacts. Personally, I generally assume that active looters are up to speed on site prospection. The average citizen is far more likely to help you protect the site if they actually understand what underlies the interpretation of a site. If there's public funding involved, then I think they have even more incentive to help protect the site's integrity, to get the full value for their investment. 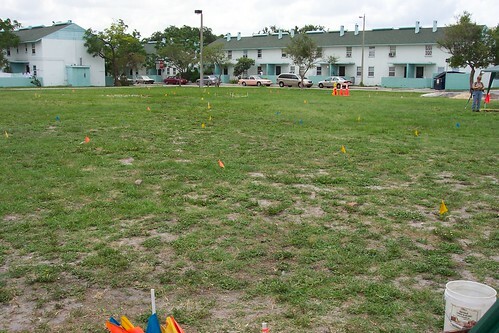 As an undergraduate, my field school was right in the heart of urban Tampa, in an economically disadvantaged neighborhood; and, we had no issues with site disturbance. We met with the community regularly, and included the local youths in some "hands-on" educational opportunities. Our signage included the equivalents of conference posters, at least in the sense of including historical photographs/maps that factored into our testing strategies. I dont know if this may help but if you are trying not to alert local residents and citizens to the fact that there are archaeological resources in the area for fear of looters, but still want them to acknowledge the sensitivity of the area, try using broader terms on your signage, such as "Environmentally Sensitive" or "No Ground Disturbance." Put a contact number and agency on the sign so anyone can call for more information. Like everyone else, I think communication is key and it is probably in everyone's best interest to have some sort of media day where you can inform everyone why you are researching here and possibly some things you are finding. Thank you all for the helpful responses! Next topic: "Looking at Colleges"
Previous topic: "Has anyone else noticed this trend?"